JNN 05 Jan 2014 Benghazi : The Libyan army has arrested two Americans at its headquarters in the northeastern city of Benghazi ,who were later released after confirmation of their Identities . The security situation has deteriorated in recent months in the North African country where the government is struggling to rein in militias and tribesmen who helped oust Muammar Gaddafi in 2011 and kept their guns. According to Reuters, neither the identity of the men nabbed on Thursday nor why they were captured was immediately clear. The United States Embassy in Libya has not made any comment on the arrest yet. “They were arrested by university guards and then brought by special forces to the army barracks,” an army source said. The State Department and Britain’s Foreign Office both said they were looking into the matter. Later The Libyan government released two American basketball players arrested by the army in the northeastern city of Benghazi. The basketball club the Americans played for said on Friday that the players were freed on Thursday night. “After their identity had been confirmed they were released,” said Salah al-Fetouri, the president of the Al-Hilal basketball club. According to Libyan security officials, the two had been arrested for their suspicious actions at the campus of Benghazi University and brought to the army’s headquarters in Benghazi. Last Friday Libyan security forces detained four US military personnel for several hours on charges of carrying weapons in the country. 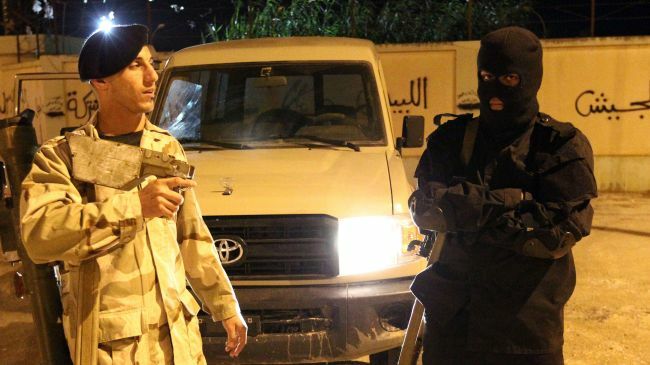 Libyan officials said on Saturday that the four were detained on Friday after part of their convoy failed to stop at a checkpoint near the town of Sabratha and was found to be carrying weapons. The officials said that the Americans were later brought to the capital Tripoli from Sabratha, which is located about 65 kilometers west of Tripoli. Libyans rose up against former dictator Muammar Gaddafi’s four-decade rule in February 2011 and deposed him in August 2011. He was slain on October 20 of the same year. Many countries have closed their consulates in Benghazi and some foreign airlines have stopped flying there. This entry was posted in AFRICA and tagged Benghazi, Benghazi University, Muammar Gaddafi. Bookmark the permalink.